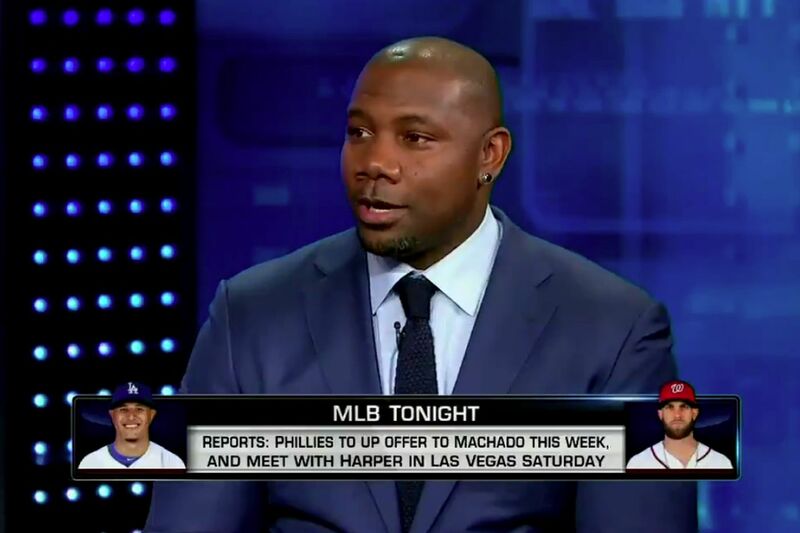 Former Phillies slugger Ryan Howard was a guest analyst on the MLB Network's flagship show, "MLB Tonight," Tuesday night. Howard, the former Phillies slugger who officially retired from baseball in September, is testing the waters as a baseball analyst during a two-day marathon of appearances on the MLB Network. Howard is scheduled to make three appearances across the MLB Network on Wednesday — Hot Stove with Matt Vasgersian and Harold Reynolds at 9 a.m.; High Heat with Christopher Russo at 1 p.m.; and MLB Now with Brian Kenny, Mike Lowell and former Phillies pitcher Dan Plesac at 2 p.m.
On Tuesday, Howard made two appearances on the network, most notably as a guest analyst on the flagship show MLB Tonight. Predictably, the discussion veered toward the Phillies' potential interest in the free agents Bryce Harper (whom the Phillies will meet with on Saturday) and Manny Machado. But Howard reminded viewers there’s a third free agent who will be available after the 2020 season that might be a better fit for the team. “I don’t think they need to go out and get Harper and Machado,” Howard said. “If you miss out, that’s not the worst thing. Because there’s a guy named Mike Trout — who I believe has season Eagles tickets — who’s there every week … Build your roster, build your team up to where you can go make a run at Trout if you’ve got that stupid money, and you’re looking to drop it." An MLB Network spokesperson said Howard was only a guest analyst at this point, though that could obviously change if his recent appearances are well-received. Howard has also had discussions with ESPN about joining the network, but a source there said nothing is on the table at the moment. “ESPN is continuing to finalize its commentator roster for the 2019 season,” an ESPN spokesperson said. ESPN has made a lot of moves recently on the baseball front, most notably poaching Yahoo’s Jeff Passan to act as the baseball equivalent of football analyst Adam Schefter. The network has also announced new contract extensions for Jessica Mendoza, Rick Sutcliffe, Mark Teixeira, and David Ross. There’s also the rumored return of Baseball Tonight to a nightly schedule, though ESPN remains mum on any details. The Phillies will lead off ESPN’s Sunday Night Baseball schedule in the upcoming season on March 31 against the Atlanta Braves at Citizens Bank Park. The Phillies appeared twice last season on Sunday Night Baseball, including the annual Little League Classic in Williamsport, Pa., in August. Howard isn’t the only member of the Phillies 2008 World Series roster looking to the TV screen for a post-playing career. Former Phillies shortstop Jimmy Rollins has been a playoff analyst on TBS since 2016, alongside former players Pedro Martinez and Gary Sheffield. He’s also made numerous appearances as a guest analyst on FS1.